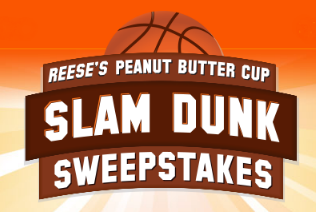 Reese’s Peanut Butter Cup Slam Dunk Sweepstakes – Win a trip to the 2016 NCAA Men’s Final Four! Win a trip to the 2016 NCAA Men’s Final Four! ENTER SWEEPSTAKES HERE – Reese’s Peanut Butter Cup Sweepstakes page. ELIGIBILITY – Sweepstakes is only open to legal residents of the 50 United States, including the District of Columbia, who have the age of majority in his or her state or territory of residence and who are 18 years of age or older as of the Sweepstakes start date. SWEEPSTAKES PERIOD – The “Peanut Butter Cup Slam Dunk Sweepstakes” begins at 12:00 p.m., Eastern Daylight Time (“EDT”) on February 27, 2015 and ends at 11:59 p.m. on March 31, 2015. PRIZES – One (1) Grand Prize Winner will receive a VIP Travel Package for winner and one (1) guest to attend the 2016 NCAA® Men’s Final Four® that will take place in NRG Stadium in Houston on April 2 & 4, 2016. The package includes two tickets for winner and a guest to both the National Semifinal games and the National Championship Final. Also included are two (2) round trip airline tickets from nearest major airport closest to winner’s resident to Houston, TX, along with 4-night hotel accommodations at a hotel in the Houston area and round trip transfers from the hotel to the National Semifinal games and National Championship Final. VIP package offers courtside tickets, access to luxury suites and celebrity-attended pre and post-game parties. Approximate Retail Value (“ARV”) of Grand Prize is $4,200. A cash option of 70% of the ARV of the Grand Prize which equals $2,940 may be accepted by the Grand Prize winner in lieu of the travel package prize. 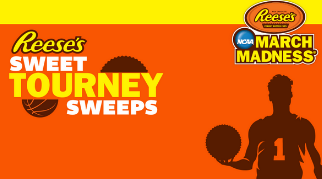 Reese’s Sweet Tourney Sweepstakes – Win a trip to the 2016 NCAA Men’s Final Four! Win a trip to the 2016 NCAA Men’s Final Four in Houston, Texas & $500! ENTER SWEEPSTAKES HERE – Reese’s Sweepstakes page. ENTRY LIMIT – Limit one (1) online entry per name/e-mail address/household per day. ELIGIBILITY – Sweepstakes open only to legal residents of the United States residing in the 50 United States or District of Columbia who are 18 years of age or older at time of entry. SWEEPSTAKES PERIOD – SWEEPSTAKES BEGINS AT 12:00:00 P.M. EASTERN STANDARD TIME (“EST”) ON MARCH 2, 2015 AND ENDS AT 11:59:59 A.M. EASTERN DAYLIGHT TIME (“EDT”) ON MARCH 31, 2015. Sponsor. Winner and guest must be available to travel between April 1, 2016 and April 5, 2016 or on dates specified by Sponsor in Sponsor’s sole discretion; no alternate travel dates available. Approximate Retail Value (“ARV”): $5,500.00. 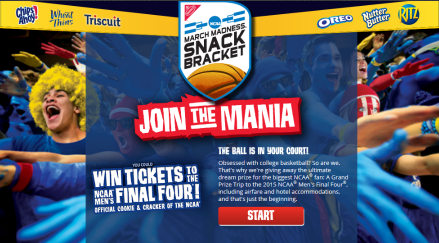 Nabisco NCAA Snack Bracket Sweepstakes & IWG – Win a trip to the 2015 NCAA Men’s Final Four! Win a trip to the 2015 NCAA Men’s Final Four and $7,470 spending money! ENTER SWEEPSTAKES HERE – Nabisco Sweepstakes page. ENTRY LIMIT – Limit one (1) game play per day per email address/person. ELIGIBILITY – Promotion is open only to residents of the 50 United States and D.C., 18 years of age and older as of the time of entry. SWEEPSTAKES PERIOD – GAME BEGINS 12:00AM ET ON MARCH 3, 2014 AND CONTINUES THROUGH 11:59PM ON APRIL 7, 2014. PRIZES – INSTANT WIN GAME: Fifty (50) First Prizes: A $50 Visa gift card (terms and conditions apply). ARV: $50. Five (5) Championship Prizes: A home entertainment system including a CLASS 55″ LG HDTV and surround sound system, a PS4 Console and game package gift basket (contents determined by Sponsor in its sole discretion). ARV: $1,820. SWEEPSTAKES: One (1) Grand Prize: A trip for four (4) to Indianapolis, IN to attend the 2015 NCAA® Men’s Final Four®. Trip package consists of round-trip coach-class air transportation for four (4) from an airport near winner’s home (determined by Sponsor in its sole discretion) to Indianapolis, IN; four (4) nights’ accommodations at a hotel determined by Sponsor in its sole discretion (two (2) rooms, double occupancy); ground transportation between hotel and airport; four (4) tickets to the 2015 NCAA® Men’s Final Four® Semi-Final and Final Games (seating determined by Sponsor in its sole discretion); a gift bag (contents determined by Sponsor); and $7,470 spending money. Approximate Retail Value (“ARV”): $32,370. 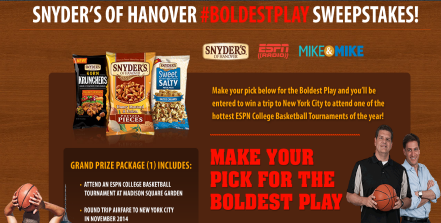 Snyder’s of Hanover Boldest Play Sweepstakes – Win a trip to NYC! Win a trip for 2 to NYC to attend an ESPN-televised college basketball tournament! ENTER SWEEPSTAKES HERE – Snyder’s of Hanover Sweepstakes page. You will need an ABC/Disney Go account to enter. ENTRY LIMIT – LIMIT ONE ENTRY PER PERSON (REGARDLESS OF WHETHER ONE PERSON HAS MORE THAN ONE E-MAIL ADDRESS) OR E-MAIL ADDRESS (REGARDLESS OF WHETHER MORE THAN ONE PERSON USES THE SAME E-MAIL ADDRESS) OR MAILING ADDRESS (REGARDLESS OF WHETHER MORE THAN ONE PERSON USES THE SAME MAILING ADDRESS) PER DAY (up to a total of 28 entries during the entire Sweepstakes Period). SWEEPSTAKES PERIOD – The Sweepstakes begins 3:00 pm EST February 24, 2014 and ends 11:59 pm ET March 23, 2014. PRIZES – Grand Prize (1): A trip for winner and one (1) guest to New York City in November, 2014 to attend an ESPN-televised college basketball tournament at Madison Square Garden. Trip includes round trip coach air transportation for two (2) from major U.S. gateway airport nearest winner’s primary residence in the U.S., 4 days/3 nights standard double occupancy hotel accommodations (one room), $200 spending money for ground transportation, behind the scenes visit to the broadcast production facilities, meet and greet with available ESPN broadcast personalities and two (2) tickets to both nights of the tournament. Grand Prize winner who lives in the New York City metropolitan area (as determined by Sponsor/Administrator) will receive local transportation for the winner and winner’s travel companion between winner’s home and the events in lieu of any air transportation. Approximate Retail Value of Grand Prize (“ARV”): $3,000.